Hundreds of health care providers around the United States allow their patients to use Apple's Health app to store their medical records. 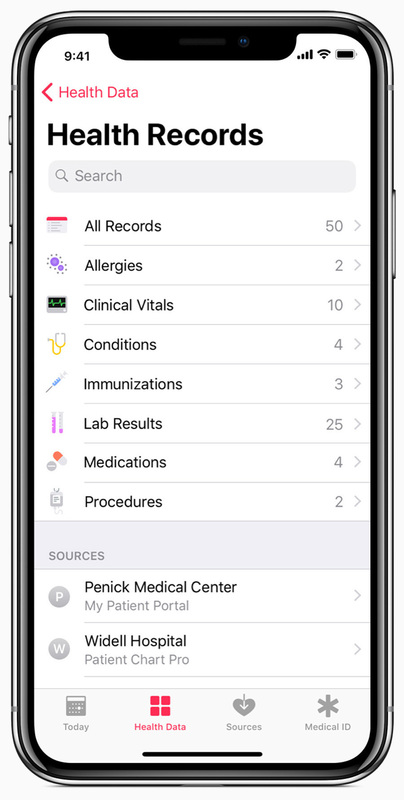 Since last March, Apple has been rolling out a feature that allows people to store their medical records in its Health app. UC San Diego Health, where Cavaliere sees his doctors, is one of more than 200 health care providers around the United States using the health records feature. Cavaliere travels a lot for work, and he likes to keep track of his blood pressure. He's able to do that using a special cuff linked to the Health app. And he likes the convenience of having the app keep his medical records. "When I go to the doctor, in addition to my records from there, I get my blood pressure results that I've taken myself," Cavaliere says. "And they can see that and compare it to what they're doing in the office so that they get a bigger picture than just the once or twice a year that I show up at the office." The global health care industry is expected to reach $10 trillion by 2022. That's bigger than the economy of any country other than the United States and China. Amazon, Google and Microsoft are among the companies vying for a piece of that pie in areas such as retail pharmacies, using artificial intelligence for disease detection and healthy-living apps. At a moment when iPhone sales have slowed and many analysts are wondering if Apple's best days of innovation are behind it, the company has been innovating and expanding its presence in health care. It's an area where the company's long-held privacy values may give it an edge over the competition — if it can hold up to the growing public scrutiny. Putting health records into an app created by a big tech company requires trust. Those records could list medications taken, treatments for diseases and visits to mental health care providers. That's not the kind of information most people want an employer, advertiser or insurance company to see. Apple CEO Tim Cook has been a vocal advocate for privacy rights. Most recently, he has spoken out against rival companies Google and Facebook for making money off user data to sell ads. Cook says Apple's commitment to privacy isn't simply a marketing ploy. "It's not the way we look at it in terms of advantages," he says. "The reality is that I know for me, I want to do business with people that have my health data, people that I deeply trust." Cavaliere, the San Diego tech worker, says Apple has managed to gain his trust. "I don't get fed advertisements for them, so I don't see them trying to monetize it," he says. Unlike with other companies, he says, "I feel comfortable with how [Apple's] doing it and what they're doing." Dr. Chris Longhurst, UC San Diego Health's chief information officer, says Apple's strong privacy values made officials at the facility feel more at ease. "Nothing is more important than keeping the privacy of our patients' health information," he says. Longhurst says the iPhone helps keep the data safe. "This data did not go into the cloud," he says. "It only resided on the user's device, is encrypted and is only accessible with user permission." Health records are also subject to strict federal privacy laws. But Apple has far from a perfect track record when it comes to privacy. At a time of heightened scrutiny of all tech companies and their privacy records, the Wall Street Journal has found that several top health and fitness apps available for iPhones send personal information, such as data about heart rates and menstrual cycles, to Facebook. 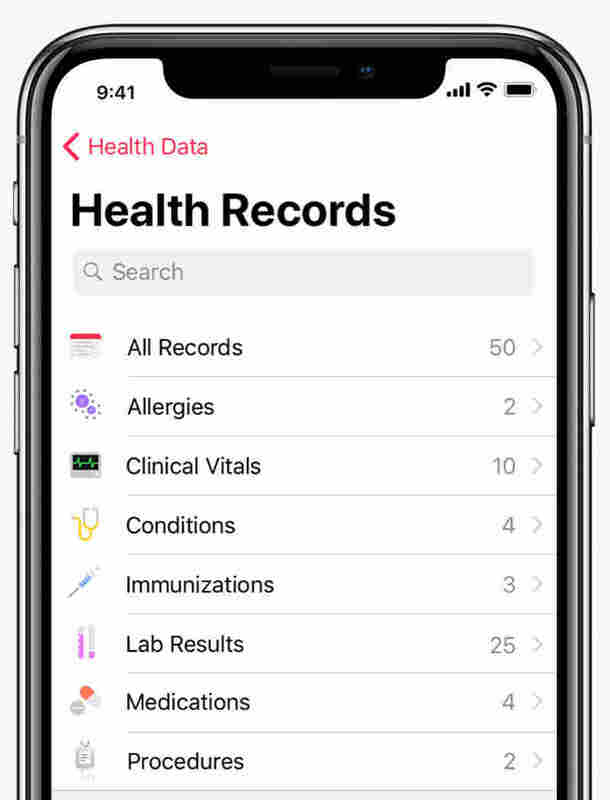 Apple says those apps don't connect to health records. It says the apps were violating its rules and the developers must fix the problem; those that don't will be removed from the App Store. Importantly, users must give permission before an app can access their health records. Longhurst says UC San Diego Health cautions patients to be careful. "There are potential risks," he says. "It is important that patients be informed so that they're not inadvertently sharing information with third parties they would not want to have this information." UC San Diego Health and other providers say they're open to working with other companies besides Apple. They just need assurances that their patients' health records will be safe, secure and private — and not fodder for advertisers.